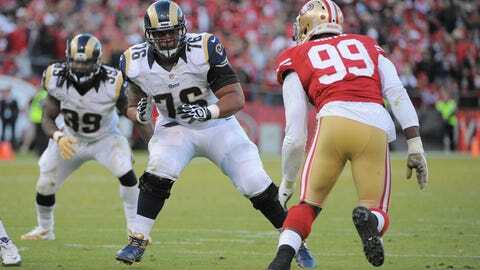 If, as expected, Rodger Saffold (76) moves on, the Rams will have one more O-line spot to fill. ST. LOUIS — The St. Louis Rams are off to a rough start in free agency. And it hasn’t even opened yet. Though nothing can become official until 3 p.m. CT on Tuesday, the Rams will likely lose key offensive lineman Rodger Saffold to a wealthy free-agent contract elsewhere. The Baltimore Sun reported Sunday that Saffold was expected to sign with the Oakland Raiders for roughly $8 million per year, though he was still in discussions with the Tampa Bay Buccaneers. Saffold’s agent, Alan Herman, told The St. Louis Post-Dispatch that he informed the Rams that his client would not be returning. At the NFL’s Scouting Combine in Indianapolis last month, coach Jeff Fisher spoke with reporters about what it meant to bring Saffold back. "Obviously, it’s important for us to get that done, and he’s expressed serious interest in coming back as well," Fisher said. "It does give us flexibility, but I think ultimately he’s going to be an outstanding guard in this league. Now, that doesn’t mean to say that he could not play either tackle because this year he did. He stepped in when (left tackle) Jake (Long) went down and stepped in here and there and played some really good football at the tackle spot." St. Louis should have some money to spend, though not a lot, following the impending release of cornerback Cortland Finnegan, which will save the team $4 million in salary cap room for the 2014 season. The team’s situation on the offensive line remains murky. Long and right tackle Joe Barksdale are both under contract for 2014. Long, however, is coming off a season-ending knee injury. The Rams released starting right guard Harvey Dahl on Monday. Another starter, center Scott Wells, could be released because of a high salary cap number. Wells, who has played just 19 games in two seasons since leaving Green Bay to sign with the Rams as a free agent, would count $6.5 million against the cap. Saffold and guards Chris Williams and Shelley Smith could all leave as unrestricted free agents. Williams started all 16 games at left guard. Smith played in 14 games and started two at right guard. If all three of those players depart, youngsters Tim Barnes, Brandon Washington, Mike Person and Barrett Jones on the current roster would be candidates as replacements or to provide interior line depth. Barnes started four games at center last season with Wells out. Jones appeared in three games during his rookie season, while Person and Washington have each played in one. "I think coach (Paul) Boudreau did a great job this year with moving people around," Fisher said at the Combine. "We had a lot of moving parts, but we showed improvement. We’ve still got some young players. … Coach Boudreau is an outstanding, experienced coach and we’ll get it done." Some possible targets for the Rams in free agency could be Zane Beadles of Denver, Jon Asamoah and Geoff Schwartz of Kansas City, Kevin Boothe of the New York Giants and Davin Joseph of Tampa Bay. Of course, with two selections among the top 13 picks in the draft, the Rams have the flexibility to add pieces to the offensive line through the draft, too. "Look for the Rams to further address their offensive line by adding a veteran guard like Jon Asamoah or Kevin Boothe," wrote Lande, a former scout with the Rams and Browns. "Both have been solid starters and likely will not be high-priced free agents. If the Rams can add (Jake) Matthews or (Greg) Robinson and a veteran guard then their line will improve in 2014. That, in turn, will greatly help (Sam) Bradford." The Rams’ starting safeties last season were Rodney McLeod (16 starts), T.J. McDonald (10 starts) and Darian Stewart (six starts). McLeod was in his second full season. McDonald was a rookie out of USC. Stewart was in his fourth year but is now an unrestricted free agent along with fellow backup safety Matt Giordano. This is an obvious area where the Rams could upgrade, but it could come at a significant cost that they might be unwilling or unable to pay. St. Louis has already been linked to having interest in Jairus Byrd of Buffalo — who played his high school football in St. Louis and even won a state championship at the Edward Jones Dome — but he will probably be looking for a contract out of the Rams’ price range. The same could be true for T.J. Ward of Cleveland and Donte Whitner of San Francisco. It is more likely the Rams will try to sign a cheaper veteran — Lande suggested Kendrick Lewis of Kansas City — and then target a safety in the draft. With Finnegan out the door, the Rams definitely could use an upgrade at cornerback. Second-year players Janoris Jenkins and Trumaine Johnson have established themselves as capable starters, but adding another player here either through free agency or the draft could only help. Signing a free-agent cornerback could also lessen the need for a starting-caliber safety. Alterraun Verner, formerly of Tennessee, is one of the hottest names out there and has links to Fisher and new defensive coordinator Gregg Williams. Williams, who was a senior assistant defensive coach for the Titans last season, even mentioned Verner in his introductory press conference last month as an example of how the players in Tennessee responded to him. "There wasn’t a lot of like for Alterraun Verner when I walked in the building," Williams said. "He didn’t do too bad this year, did he? He made his first Pro Bowl and there was a lot of people that were wondering whether he would even make the team." Verner, who just completed his fourth season, started 16 games in 2012 and in 2013, when he grabbed five interceptions. The 25-year-old won’t come cheap, though, especially after Green Bay just re-signed Sam Shields to a reported four-year, $39 million deal that includes a $12.5 million signing bonus. Before long, Verner will be swimming in a pool of money like Scrooge McDuck. We’ll have to wait and see whether that happens in St. Louis.